White Tigers are very rarely found in the wild. In about 100 years only 12 white tigers have been seen in the wild in India. They are almost extinct and most of the ones living are in captivity, mostly in zoos. 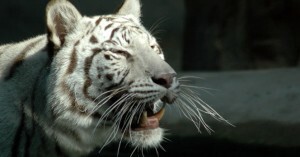 This specific tiger is neither an albino nor a separate subspecies of the tiger. 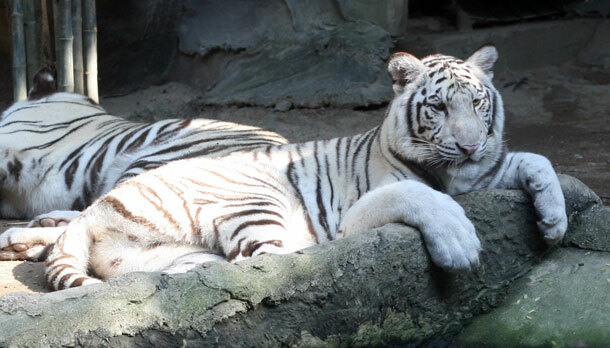 They are beautifully white colored and have black stripes. It has blue eyes and a pink nose. It also has white colored fur. The striking white coat is caused by a double recessive allele in the genetic code, and only turns up naturally about once in every 10,000 births. Amazingly, the Bengal tiger is the only subspecies in which it seems to happen. Diet: The majority of the tiger diet consists of various large ungulate species. Distribution: It is native to India, Bangladesh, Nepal and Bhutan. Habitat: They are known to occur in tropical lowland evergreen forest, monsoonal forest, dry thorn forest, scrub oak and birch woodlands, tall grass jungles, and mangrove swamps. Khao Kheow Open Zoo one of the major attractions of Bangkok has many species of Tigers. If you are in Thailand for an adventure with your family, Khao Kheow Open Zoo is not a place to be missed.